On June 2, 2015, Melissa Jude was on the way to Ned Pillersdorf’s office when she pulled over to the side of the road and ended her life. The week before, SSA demanded that she justify her benefits or pay back every cent, and Jude learned she would not get her records in time to meet the deadline. Melissa Jude was not the first of Conn’s clients to take their own life, and Pillersdorf worries that there will be more. When Jude received her termination letter, so did 900 others in eastern Kentucky. Pillersdorf remembers when the letters arrived in Floyd County. Local attorney John Earl Hunt called Pillersdorf. “Ned,” he said, “there will be suicides.” And since then, termination letters have arrived in the mailboxes of at least 3,000 people. 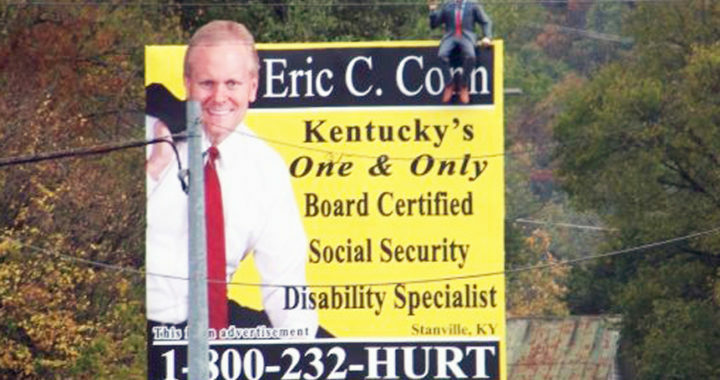 In 1993, Eric Conn opened a law practice in a trailer next to his childhood home in Stanville, Kentucky. Over the next 23 years, he soon earned the nickname “Mr. Social Security” and built the largest disability benefits practice in the United States. Conn used an elaborate scheme of bribing doctors, administrative law judges, and SSA officials in one of the largest governmental frauds in US history. By 2013, Conn housed his operations in an elaborate trailer complex on Interstate 23, a roadway known as “Country Music Highway” which slinks through the heart of Appalachia’s coal country. At his peak, Conn had over 300 billboards, a statue garden complete with a Lincoln Memorial replica, and a satellite office in Beverly Hills, California. By the time of his 2016 indictment, he had become the third highest paid disability lawyer in the United States. The first round of SSA termination letters quickly expanded from 900 to 1,600 people and Ned began a one-man mission of raising awareness about the cases. Soon, Pillersdorf enlisted the help of Appalachian Research and Defense Fund (AppalReD Legal Aid), an organization founded in 1971 by poor people advocates and located two blocks away. Ohio legal aid lawyer Rob Johns was months into his new job as executive director of AppalReD, where he was working tirelessly to stabilize the organization after years of financial strain. But when the letters started arriving, Johns and AppalReD threw themselves into defending claimants. “It wasn’t a choice,” Rob Johns later said, “We had to do whatever we could to do to help.” Johns, who had never practiced in Kentucky, started representing clients and going to the courthouse to file continuance motions. Pillersdorf and AppalReD started organizing meetings at the Floyd County Courthouse for Conn’s former clients. At the first meetings, there was standing room only. Soon, the scrappy group of two dozen lawyers working over an area of 37 counties had hundreds of clients. AppalReD started putting out the call for help and recruiting volunteer attorneys to represent clients. Claimants often wait until the day of their hearing before trying to get help, and then it is too little and too late as there are only so many lawyers who can help in eastern Kentucky. Upon unfavorable judgments claimants are given notices ordering repayment of hefty sums, sometimes up to $100,000. The Conn Crisis comes at a time of vulnerability for Appalachia. For the last decade, a never ending stream of crises have wracked Appalachia: the loss of the coal industry, the subsequent subprime mortgage, and the Opioid epidemic. In many if not most counties, the population has dropped by ten percent or more in a mass exodus spanning over five years. But the poverty population remains fixed because the poorest do not have the resources to leave. Now the Conn cases are flooding court dockets. “People are trapped,” Ward-Allen said. Since the terminated started, lawyers have accused SSA of violating due process. Litigation remains stalled in the 6th Circuit and does not seem likely to be resolved soon. Worse, the Lexington Herald-Leader reported this month that Pillersdorf and others have recently learned that hundreds of boxes of medical records are sitting untouched in Conn’s former offices. In March, Pillersdorf asked the U.S. Department of Justice to seize Conn’s properties. Then in May, Pillersdorf desperately asked the Kentucky Bar Association to use its authority under state law to appoint a special commissioner to receive the files. In June, John D. Meyers, executive director of the KBA, informed prosecutors that it would not be appointing a receiver for the files. “The process for appointing a special commissioner is cumbersome and time-consuming,” said Meyer. Conn initially pleaded guilty in 2017, taking a 12-year federal prison sentence, and then earlier this month, 15 years were added to his initial sentence for a total of 27 years. The court also ordered Conn to pay over $175 million in damages. Back at the SSA, however, justice is slow-coming for Conn’s clients. Although the SSA is allowing lawyers to represent clients remotely, Pillersdorf and AppalReD worries that volunteers have started to drop off. “Private attorneys are just not showing up to help like they were before,” said Rob Johns. With thousands more cases left unresolved, Pillersdorf and AppalReD have started a campaign of recruiting law students to help. While knowledge of social security is helpful, the hearings are narrowly focused, meaning that lawyers can start to plug in immediately and help. “The truth, though, is that we need law students,” said Pillersdorf, “while every seasoned lawyer who helps makes a major difference, 2,000 is too many people. The challenge is to expand the role of students.” Some schools, such as Berkeley, Georgetown, Vanderbilt, and Fordham, have established clinics for students who want to come to the help of Conn’s former clients. Even so, it may take years for Conn’s clients to ever find justice. In late July, we sat with Ward-Allen at AppalReD’s office. Rumors were circulating that Conn’s office might have files for as many as 12,000 of his former clients, and that the SSA might start removing benefits for clients disabled as early as 2003. In the summer of 2018, we went to Appalachia to work as Guild members with AppalReD Legal Aid, and like many others, we had never heard of Eric Conn or the crisis he started. After living and working in Appalachia, we departed in August knowing that we had an obligation to share what we had learned. We knew that Conn’s clients needed the support of an organization, one that had always answered the call to fight injustice. We knew that we needed the Guild. The NLG is working with Ned Pillersdorf and AppalReD to mount a response to the crisis. If you want to help, fill out our form here. Email ConnAid@nlg.org with any comments or questions. For Guild members in New York City: On October 10, 2018, the Stein Scholars Program for Public Interest Law and Ethics at Fordham Law in conjunction with Fordham NLG will be hosting Ned Pillersdorf to conduct a training on representing former Conn client disability claimants. Please feel free to join us at the training at Fordham Law, 150 West 62nd Street, New York, from 4:30-6:30pm in the Moot Courtroom on the first floor. *Tyler Crawford is a National Lawyers Guild Haywood Burns Fellow and third-year law student at Fordham University where he is a Stein Scholar with the Stein Center for Law and Ethics and specializing in legal aid, worker advocacy and community organizing. *Jessie Boas is a National Lawyers Guild member and third-year law student at Fordham University where she is a Stein Scholar with the Stein Center for Law and Ethics and specializing in immigration, policy advocacy and access to justice. Posted in NLG Blog and tagged Disability rights, Haywood Burns, Kentucky, NLG Students. ← Call for NLG Faculty and Scholars!